Sturdy and economical, these Vinyl Shop Ticket Holder keeps job tickets, work orders, production schedules, inventory cards and more secure and protected. Great for two sided documents because both sides of these strong vinyl holders are clear. Welded, non-rip seams hold up in even the roughest environments. Punched hole at top for convenient hanging. 8 1/2 x 11. 50/BX. Learn about the wide variety of shop ticket holders at C-Line..
Hi, I'm John with C-Line and today we're going to talk about our Vinyl Shop Ticket Holders. 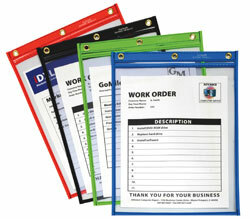 Store, organize and display two-sided documents with these clear and strong vinyl holders. Post information wherever you need it throughout your business, warehouse, school or home. The holders are manufactured from durable vinyl with welded non-rip seams to hold up in even the roughest of environments. They have a convenient drop down front so you can easily insert your information and they feature a punched hole at the top for hanging. Vinyl shop ticket holders store and protect job tickets, work orders, inventory lists, emergency phone numbers and more. There are unlimited uses for this versatile product. Display information wherever you need it with C-Line's Vinyl Shop Ticket Holders. Order yours now! That's all we have for today. I'm John with C-Line. Thanks for watching.